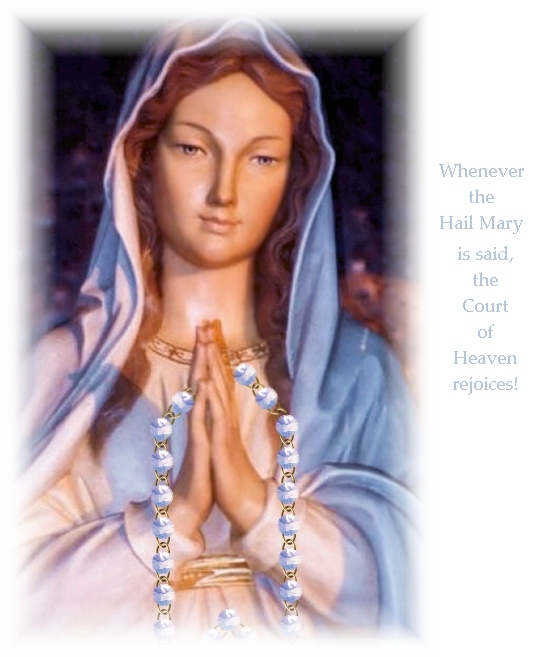 THIS IS THE right time to say a little about Indulgences which have been granted to Rosary Confraternity members so that you may gain as many as possible. Briefly, an Indulgence is a remission or relaxation of temporal punishment due to actual sins, by the application of the superabundant satisfactions of Jesus Christ, of the Blessed Virgin Mary and of the Saints----which are contained in the Treasury of the Church. A Plenary Indulgence is a remission of the whole punishment due to sin; a partial indulgence of, for instance, one hundred or one thousand years [in Montfort's time-----the Web Master] can be explained as the remission of as much punishment as could have been expiated during one hundred or one thousand years, if one had been given a corresponding number of the penances prescribed by the Church's ancient Canons. Now these Canons exacted seven and sometimes ten or fifteen years' penance for one single mortal sin, so that a person who was guilty of twenty mortal sins would probably have had to perform a seven year penance at least twenty times, and so on. 3. they must say the prayers and carry out the good works designated by the Bull. If, in accordance with what the Popes have said, one can gain a partial Indulgence (for instance, of one hundred years) without gaining a Plenary Indulgence, it is not always necessary to go to Confession and Holy Communion in order to gain it. Such partial Indulgences are many of those attached to the Rosary (either of five or of fifteen decades) to processions, blessed Rosaries, etc. Be sure not to neglect these Indulgences. Flammin and a great number of other writers tell the story of a young girl of noble station by the name of Alexandre, who had been miraculously converted and enrolled by Saint Dominic in the Confraternity of the Most Holy Rosary. After her death she appeared to him and said that she had been condemned to seven hundred years of Purgatory, because of her own sins and those that she had made others commit by her worldly ways. So she implored him to ease her pains by his prayers and to ask the Confraternity members to pray for the same end. Saint Dominic did as she had asked. Two weeks later she appeared to him, more radiant than the sun, having been quickly delivered from Purgatory through the prayers that the Confraternity members had said for her. She also told Saint Dominic that the Holy Souls in Purgatory had given her a message to beg him to go on preaching the Holy Rosary and to beg their relations to offer their Rosaries for them, and that they would reward them abundantly when they came into their glory.